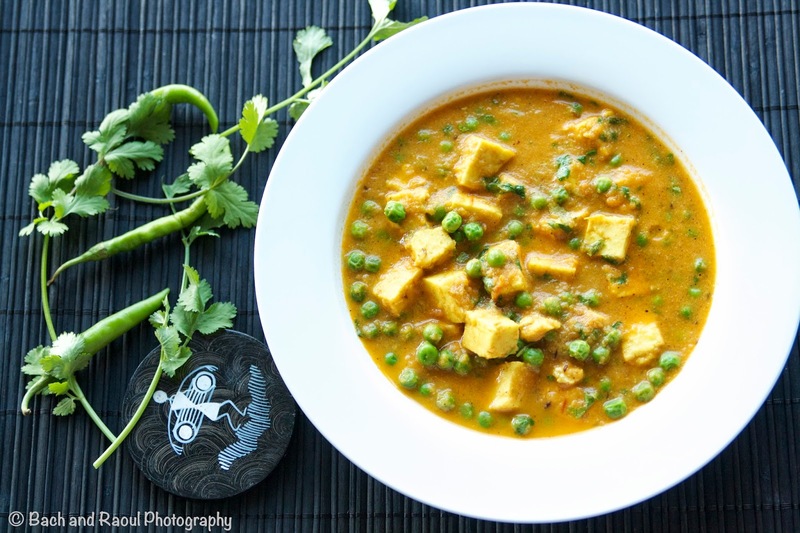 Paneer, a kind of farmer's cheese is very common in vegetarian Indian cooking and is often made fresh. It is actually not that complicated to make. I will post step by step instructions for you the next time I make some. It is, however, fairly easy to find frozen paneer from Indian grocery stores for a quick weeknight meal. I recently found my old favorite, Amul Malai Paneer at the Indian store, so you can expect a few paneer recipes coming up on this blog. 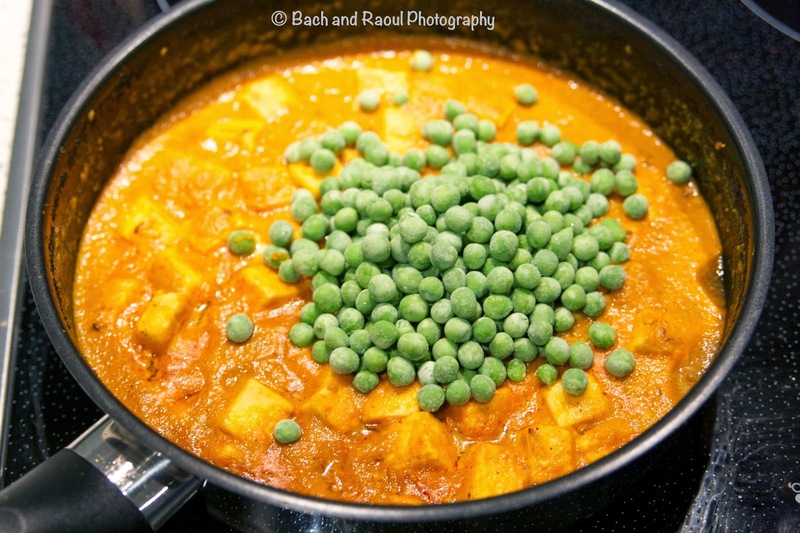 Matar Paneer first! 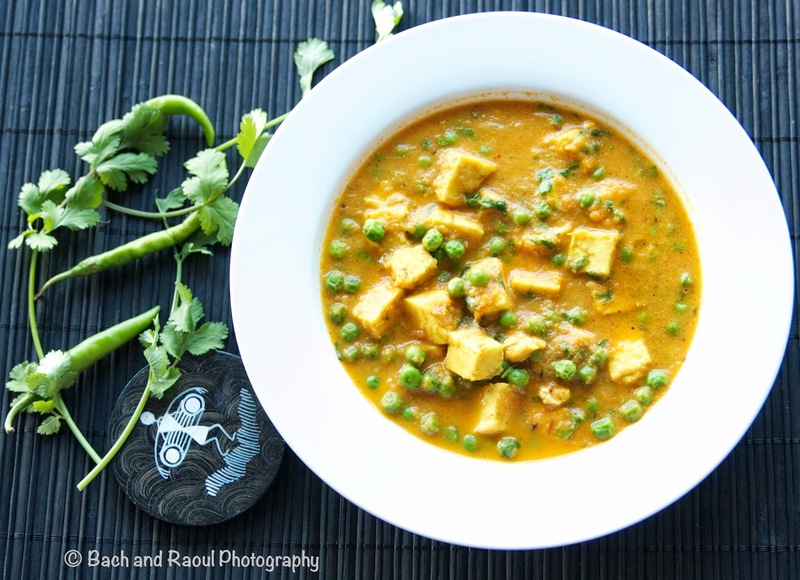 Matar (pronounced "Mutter"), meaning peas, and paneer cooked generally in a tomato based sauce. 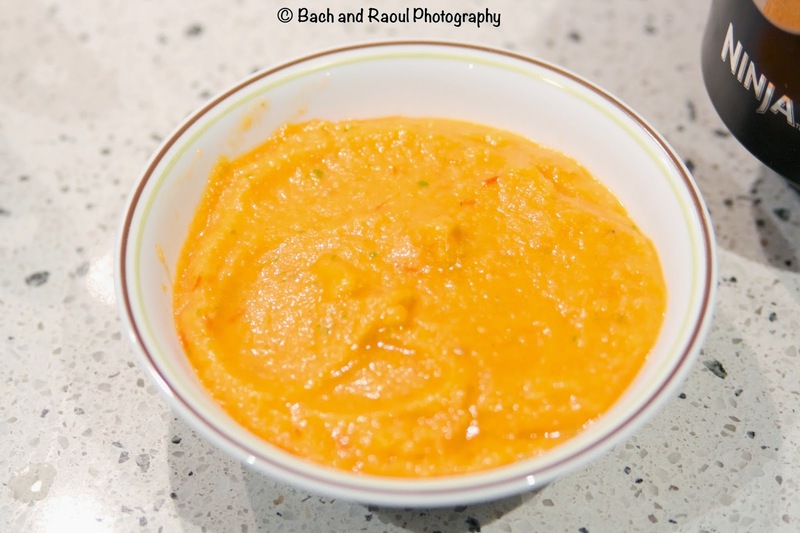 In this recipe I use yoghurt, but you can substitute it with cream or evaporated milk if you like, for a richer sauce. The yoghurt also gives this a bit of tang. 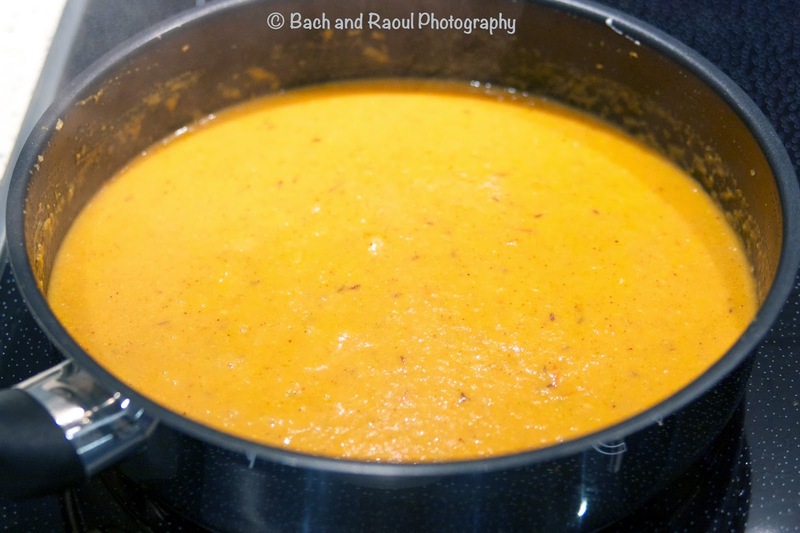 The recipe matures well, i.e, leftovers taste great the next day! 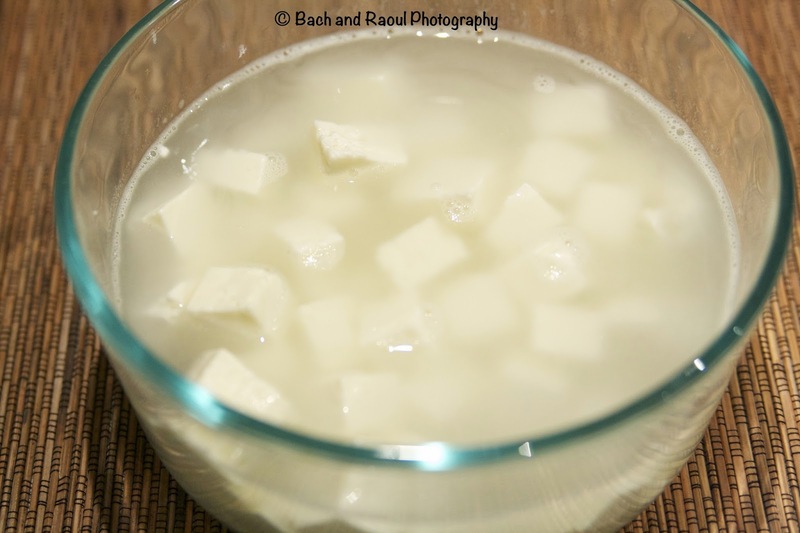 Soak the paneer in warm water to soften them. 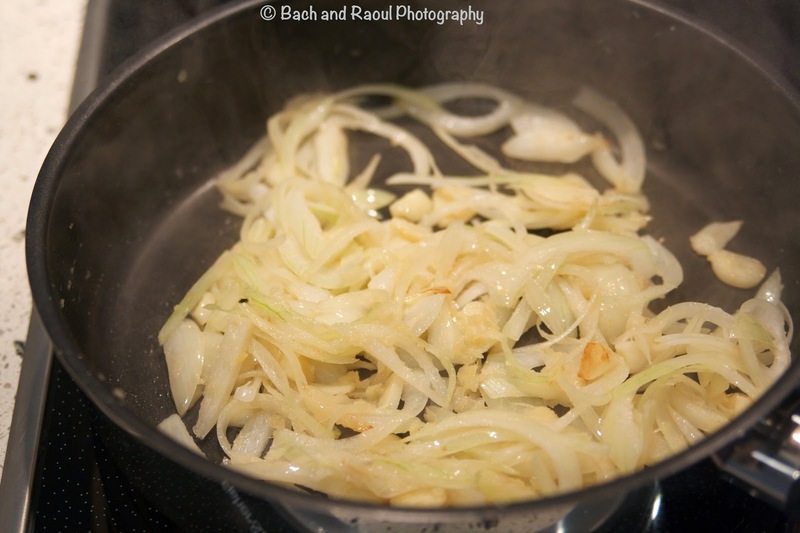 Heat 1 tbsp oil in a pan and sauté the onions till they start to turn translucent. Add the ginger and garlic and cook for another minute or two. 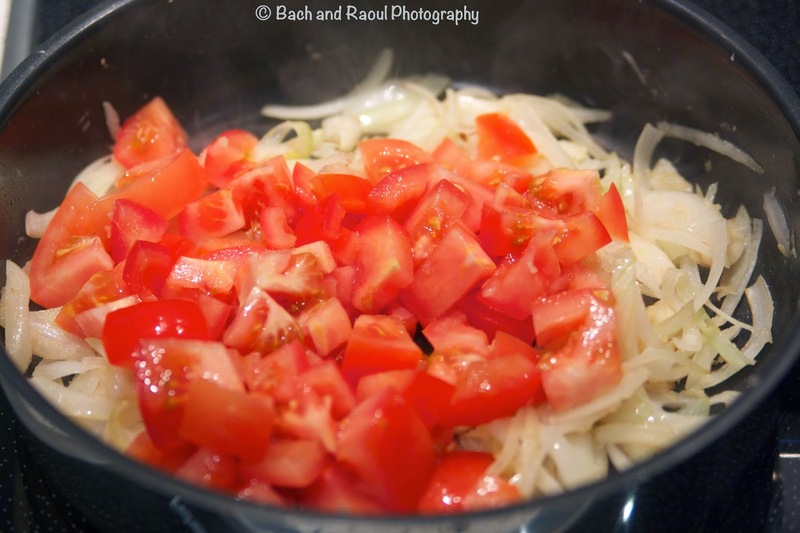 Add the diced tomatoes and roughly chopped green chili and cook the tomatoes down to a pulp. Add a little salt to help it along. Cooking the tomatoes this way, instead of pureeing them raw, retains their vibrant color. 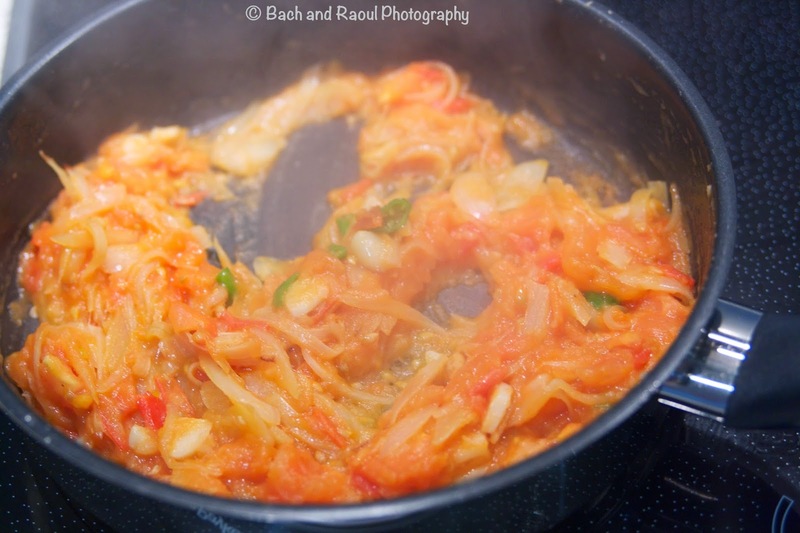 Once cooked, grind this tomato-onion mixture. I use a Ninja, so I don't have to wait for it to cool. 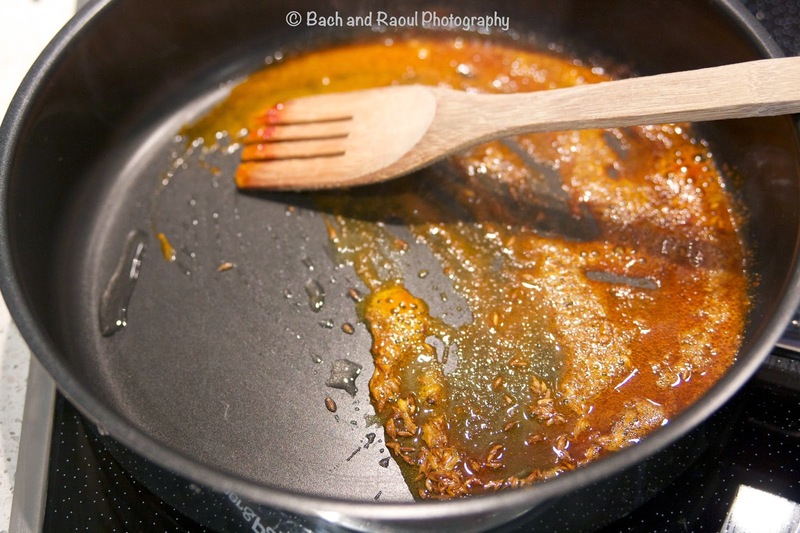 Heat the rest of the oil in a pan and add the cumin seeds. 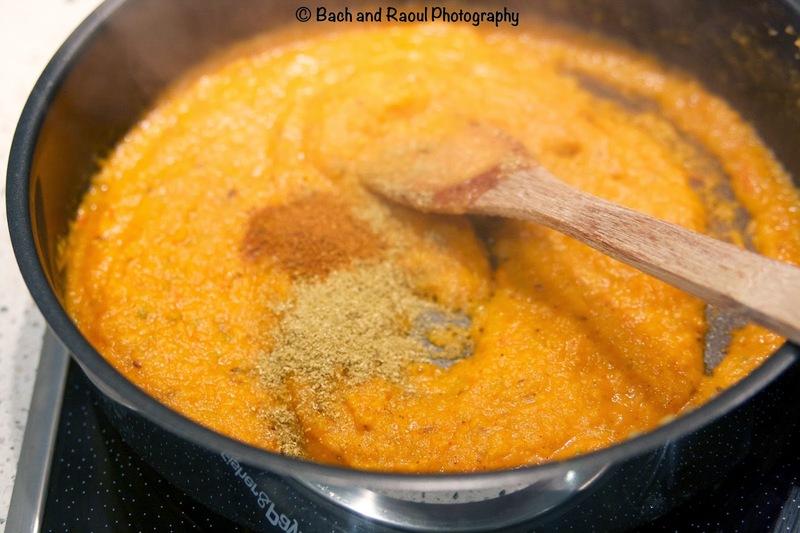 When the seeds start to sputter, add the hing, turmeric and red chili powders. Lets it all sizzle in the smoking oil for a few seconds. 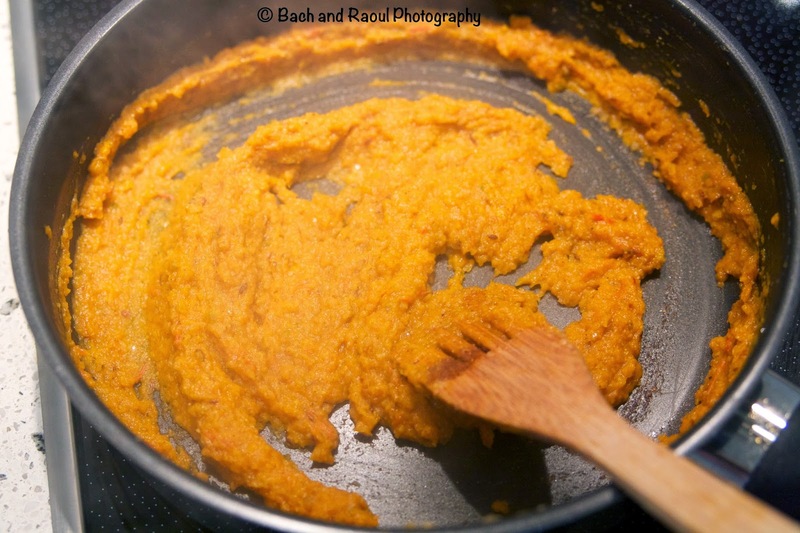 Add the tomato-onion puree that you prepared in the last step. 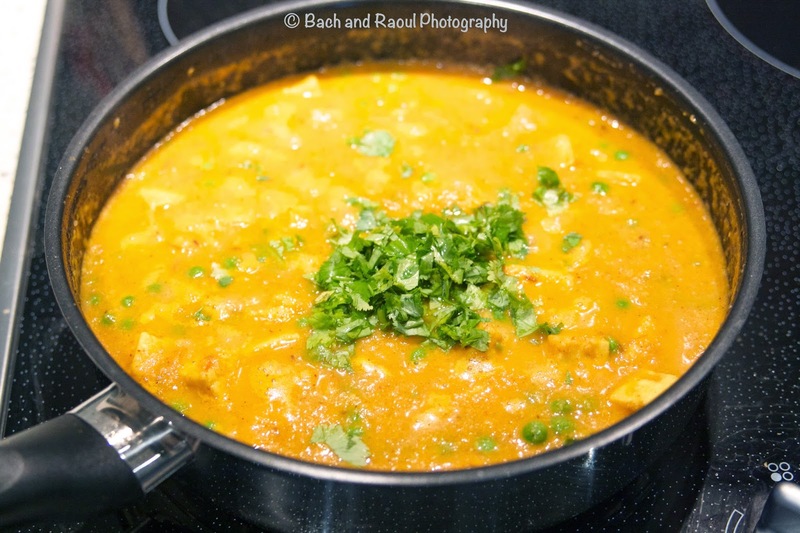 Add garam masala powder and Coriander powder and stir it all together and cook it all together for a 5-6 minutes, stirring frequently till it starts to stick to the bottom. 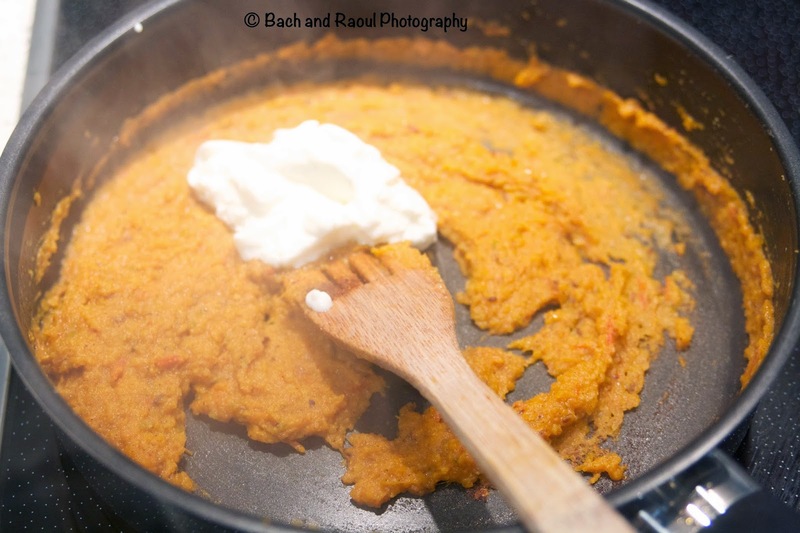 Add the yoghurt now and turn the heat down low to medium hot, as yoghurt has a tendency to split. 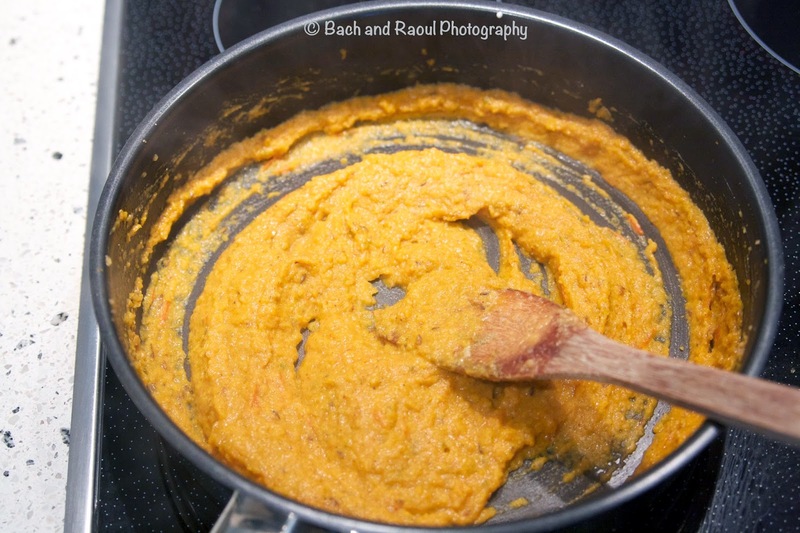 Cook this for 3-4 minutes on low heat and add a cup and a half of water. Bring it to a slow simmer. 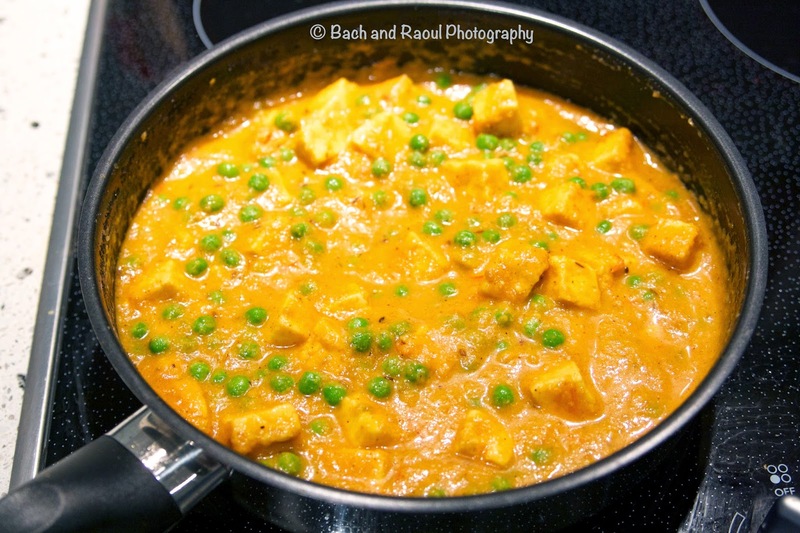 Add Paneer and green peas and cook it all together for another 3-4 minutes. Stir in chopped cilantro (coriander) leaves. Hi.. 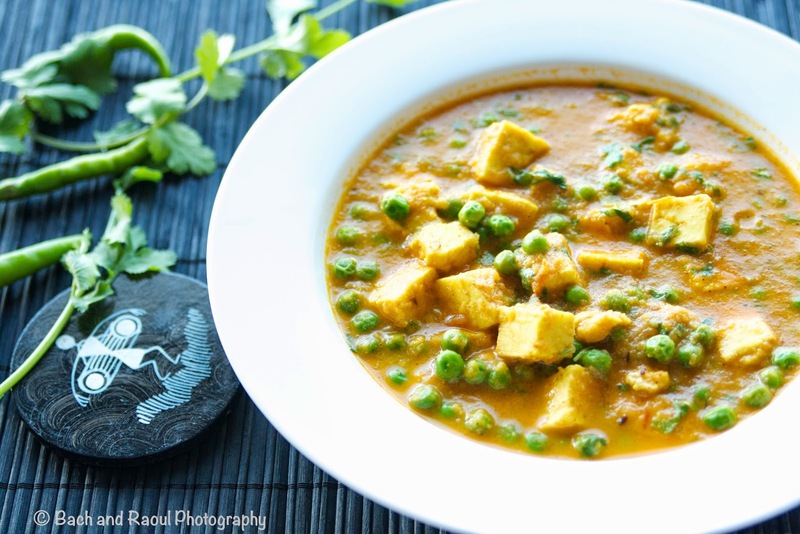 Very nice receipe :) but wanted to know if you have used raw peas or cooked peas? Thanks! I have used frozen raw peas. They cook very quickly!